We need a mandatory course in every high school that looks at society through the lens of ethics and morality, rather than efficiency and productivity. August 10, 2011 | This article appeared in the August 29-September 5, 2011 edition of The Nation. This quote appears on the first page of my dad’s book Ill Fares the Land. The book is a call to arms for my generation: if we do not learn to “‘re-think’ the state” and break away from the purely money- and market-oriented world we were born into, these questions of right, justice and betterment of society will fade. This, my dad argued, would be catastrophic. My generation must be capable of looking at society through the lens of ethics and morality rather than efficiency and productivity. The question, then, is how to engineer this change before we, too, become engulfed by an obsession with wealth. How do we engage in conversation and debate about issues that, as Dad put it, “we have forgotten how to talk about”? Liberty is now commonly defined—especially in the United States—as the right to be free of restriction from a repressive state. If that state makes you act in a certain way, makes you spend your money in a certain way, makes you subscribe to a certain program—even if it benefits you and your community—your liberty is being infringed upon. As Dworkin put it, “With today’s popular definition of liberty…you get the song of the Tea Party. This is nonsense.” Government is designed to provide safety, security and prosperity to citizens; it needs to ask things of us in return. As my dad put it in Ill Fares the Land, “Government can play an enhanced role in our lives without threatening our liberties.” This is nothing new. Citizenship entails both rights and obligations, and those obligations to the state do not infringe upon our liberty—in fact, they help ensure it. These two “bad ideas” struck me as particularly threatening because of their startling popularity. The misconception of liberty expands and festers in right-wing American politics; more and more people appear to subscribe to its faulty premise. The direct link between money and happiness, money and the good life, also continues to strengthen with very little visible opposition; indeed, I can see it very clearly in the elite New York City private school I attend. The media, sometimes tacitly and other times openly, encourage these ways of thinking. Dworkin offered a solution to these threats. He proposed a mandatory course on contemporary political issues in every secondary school. But the course would not be a current events or civics class. It would examine the political debates of the day from an ethical standpoint. Instead of asking “Will this provide us with more wealth and money-making opportunities?” or “Is this a smart political move?” or “Is this stance cost-effective?,” the questions would be “Does this aid society as a whole?,” “Is this law just?,” “Is this opinion fair?” and “Is this the right thing to do?” Tough questions, yes, but ones that are fading and must be revived. Dworkin acknowledged that it would be difficult to implement such a course, and that the temptation would be great to slip back into the fashionable discourse the class is designed to combat. But, he said, if we had the right people constructing the course and choosing the readings, the task would be possible. I am 16, the age at which Dworkin proposed the course be aimed. 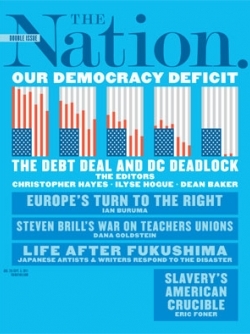 At Dalton (my school), political debate is one-sided (everyone claims to be a Democrat) and no one brings up or contests the “bad ideas” because, as Dad said, “We are intuitively familiar with issues of injustice, unfairness, inequality and immorality—we have just forgotten how to talk about them.” Furthermore, most intelligent kids have trained themselves to focus solely—sometimes excessively—on schoolwork. This is what they are told will lead to good grades, a good college and more opportunities to succeed, make money and “be happy.” They do not look carefully at political issues because, cynically put, they do not see that they have anything to gain from it. So why not put that sort of thinking into a course? Students will then focus on it and will gradually realize that ethical and moral questions, not questions of money and production, are the true political questions. Ideally, the course would help students build an immunity to simplistic political debate and the evasion of difficult moral questions. In Dworkin’s view, if the course worked as intended, people would realize that the right policies to pursue are those of social democrats. I agree with him (as did everyone in that conference room, and as do most reading this magazine). But as Dworkin acknowledged, the course cannot be billed that way—a more diplomatic approach is required. The ideas of liberals and conservatives, Democrats and Republicans, should be equally represented and scrutinized. My dad wrote Ill Fares the Land as a call to arms. 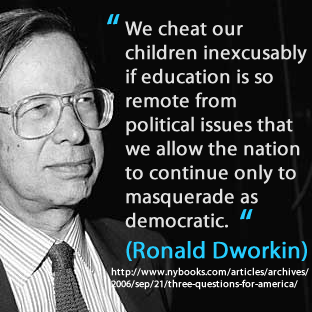 Dworkin has given us a way to answer that call. The two of them have offered us the tools we need to achieve a better society based on equality and right; it is our responsibility to take up their offer. One of my dad’s favorite quotes, which he used as the closing line of Ill Fares the Land, was from Marx; he repeated it to me whenever we discussed society’s faults: “Philosophers…have hitherto only interpreted the world in various ways; the point is to change it. Daniel Judt, a junior at the Dalton School, is a section editor of his school’s political magazine, Realpolitik….